With free Wi-Fi and parking rooms with microwaves and mini-fridges and a daily continental breakfast the Western Motel is an affordable choice for our guests. 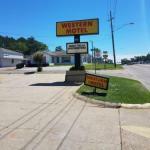 The Western Motel is a low-rise hotel that offers 47 rooms with cable TVs microwaves and mini-fridges. A continental breakfast is served daily. Stay connected with free Wi-Fi. Refresh your wardrobe at the on-site guest laundry. Pets are welcome. Parking is free. Non-smoking rooms are available. The front desk is open around-the-clock. The hotel is located off I-59 two blocks from the campus of University of Southern Mississippi. Stock up on college supplies at the Turtle Creek Mall two miles away. It's less than 10 minutes to Shadow Ridge Golf Club and Timberton Golf Club. Forest General Hospital is one mile away. The hotel is 10 miles from Hattiesburg-Laurel Regional Airport.